There’s a scene in the movie “Idiocracy” in which a character cheers as cops blow a car to smithereens. “That’s your car!” another, less dumb, character points out. The idiot, a lawyer named Frito, keeps cheering. I felt kind of like the less-dumb guy in Los Angeles Superior Court a week ago, when I watched a lawyer for the Los Angeles Times defame me and twist the facts to a level rarely seen outside a White House press briefing. I was Kelli Sager’s victim. Sager, a partner at the pro-business law firm Davis Wright Tremaine, is a shark. She argued before a judge that the Times was right to knowingly lie about me in its pages, that the First Amendment meant the Times was immune from defamation and libel law, and that I should pay the Times hundreds of thousands of dollars for their legal fees for having had the temerity to sue them. And, she was successful (for the time being). It was strangely thrilling to watch a professional — granted, a professional dissembler for a newspaper corrupted beyond belief — at the top of her game. To paraphrase Hunter S. Thompson: when the lying gets weird, the liars turn pro. For decades, the Los Angeles Times was one of the best newspapers in the United States. It was arguably the best full-service paper — like the New York Times, LA had all the foreign bureaus and deep national and local coverage required of a great news organization, along with the features New York doesn’t carry but readers like me enjoy: comics, horoscopes and advice columns. Every newspaper has struggled to adapt to the Internet. But the LA Times has had more trouble than most. If I were in charge, I’d rebrand it. The New York Times is the national paper of news and culture, the Washington Post is the national paper of politics, the Wall Street Journal is the national paper of business, and the Los Angeles Times ought to be the national paper of entertainment — movies, music and gaming. Instead, the LA Times is doing things the same way they did in 1997, but less so. Things turned from bad to worse in 2000, when the Tribune Company (as in the Chicago Tribune) acquired the Times. Flailing ensued. The Times’ idiocy culminated in 2005 with “Wikitorial,” a bizarre experiment that allowed readers to add to editorial content. In 2007 Tribune sold itself to real estate mogul Sam Zell, who ran up debt, sucked money out of the company and “busted” it, declaring bankruptcy a year later. It was the beginning of the end. I began working for the Times in 2009. Desperate for cash, the Times turned to a sketchy Los Angeles financier and billionaire with no journalistic experience, Austin Beutner, naming him as publisher in 2014. Beutner, a political ally of the LAPD who received an award for “support [to] the LAPD in all that they do” from the LAPD union months after taking over the Times, appears to have midwifed the first known acquisition of a major American newspaper by a government agency: the LAPD union moved its $16.4 billion pension fund to a Beverly Hills investment firm called Oaktree Capital, which then became the #1 shareholder of Tribune, the Times’ parent company. Like cats and mice, cops and newspapers shouldn’t go into business together. In 2015, billionaire Beutner fired me as a favor to his friend, the allegedly corrupt $300,000-a-year LAPD Chief Charlie Beck, whom I had criticized in my cartoons. They used evidence that turned out to have been trumped-up, and which boomeranged because it supported me, to smear me as a liar and fabulist. So, I sued them for defamation and wrongful termination. The Times then fired Beutner. On June 21, the court heard the Times’ first of three anti-SLAPP motions against me. Anti-SLAPP motions are supposed to protect free speech, but in this case the Times — part of a $420 million media conglomerate — is asking the court to dismiss my case and charge me at least $300,000 in their legal fees. The Times has been busy in court. They’re also fighting a pair of age discrimination lawsuits filed by a sports columnist and a Pulitzer-winning reporter who say the Times tried to save money by harassing them into quitting their jobs. Nothing is sure in life or in court, but I feel confident than a jury would agree with me that what the Times did to me was wrong. 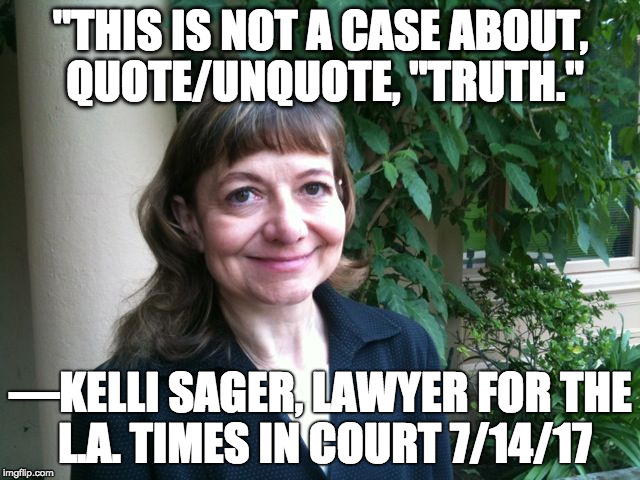 I think Kelli Sager, the Times’ lawyer agrees. Which is why she’s been working hard to keep my case away from a jury. On June 21, Sager fed the judge a bunch of nonsense, but two things she said during oral arguments especially blew me away. Referencing the first of two articles which falsely accused me of being a fabulist, Sager told the judge that the Times had included links to LAPD records (they’re not really from the LAPD but that’s another story) so Times readers could judge for themselves. No, actually, they didn’t. No one objected. Sager even brought up race. She accused me, as a white man, of falsely accusing the African-American cop who arrested me for jaywalking in 2001 of misconduct —because he was black. This entry was posted in Blog, Columns and tagged Kelli Sager, LA Times, Lawsuit, liars, libel, los angeles times, Lying, media, newspapers, race, Rall v. LA Times on June 30, 2017 by Ted Rall.